Like they say: Nothing beats the original. Despite the decades since its release (this film actually premiered the same day as my birthday, but in 1976) up to now, one can safely assume that slapstick comedy transcends time. It was funny then, and it sure as hell is funny now. And the great thing is, director Blake Edwards doesn't focus too much on the slapstick. It sort of just happens. And aside from the physical comedy, we have Peter Sellers, whose lines in the movie are simply classic. For me, John Cleese and Peter Sellers belong to that exclusive league called "Old, Handsome, and Riotously Funny British Males." And again, Steve Martin's remake of Inspector Jacques Clouseau may be funny, but like I said, nothing beats the original. 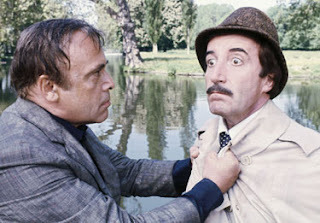 Peter Sellers is still the best. The Pink Panther Strikes Again. UK. 1976.